← 2.25″ Turbo Compressor Inlet + 3″ Turbo Inlet Hose = ??? 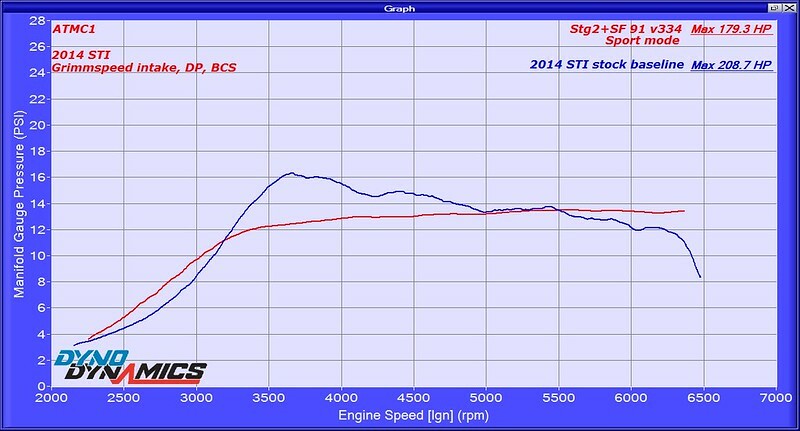 Grimmspeed recommends using the Cobb maps for the (Cobb) SF intake until a custom tune can be done. 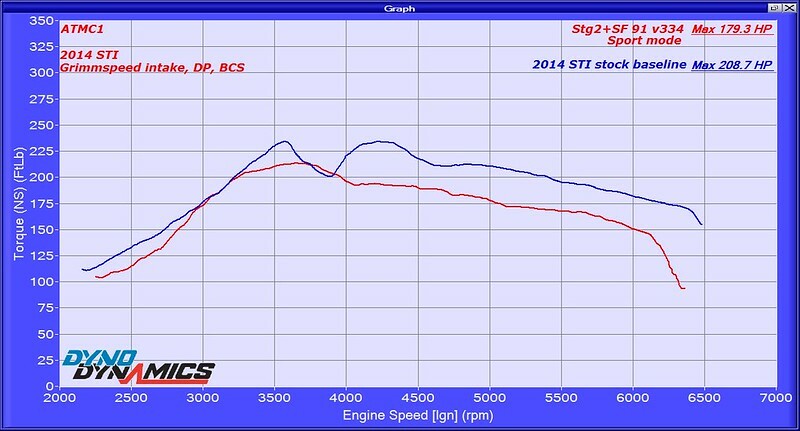 This particular car had, in addition to the CAI, a downpipe, turbo inlet hose, and a 3-port boost solenoid. The Cobb map used was “Stage2+SF 91 v334”. 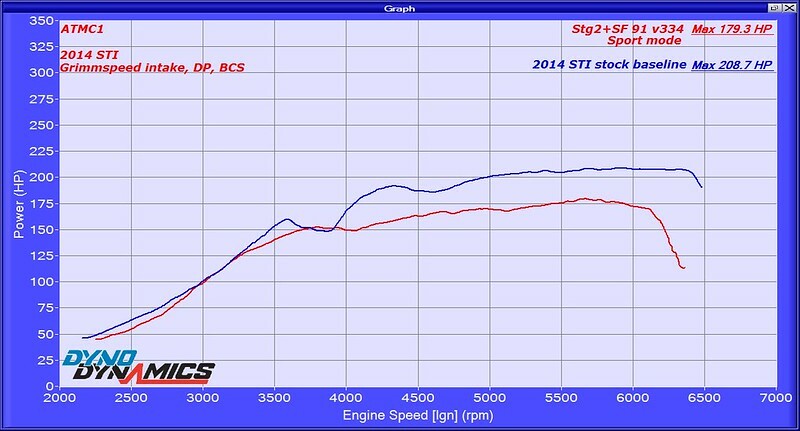 For comparison, stock baseline data from another 2014 STI is overlaid in the charts. At 5000RPM and above, boost is same or higher than stock. 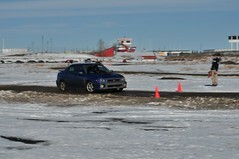 However, torque and power is much lower than stock. 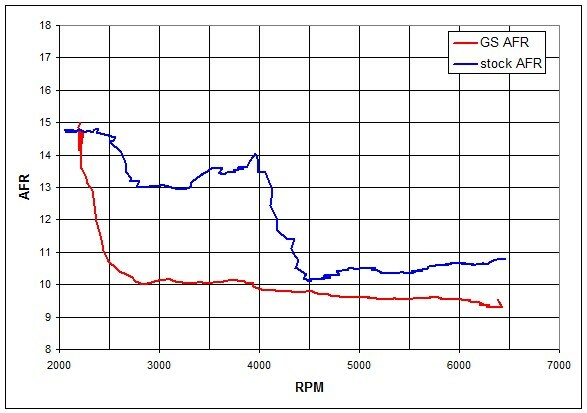 At 6300RPM, power is down by ~80whp. The cause? Over metering of airflow. With the SF calibration, airflow readings are ~20% higher than actual, leading to AFR that drops to ~9:1 at 6300RPM. The rich mixture burns too slowly to make power. With higher-than-actual airflow readings, ignition advance is also reduced, which then lowers power output. Not accounted for, the addition of the intake actually caused a loss in power output. In addition to the air intake, this car had muffler deletes. Owner installed the intake and drove it for weeks using the factory calibration. Check Engine Light (CEL) came on with P0171 (System too Lean). A: Ignition Advance Multiplier (IAM) is at 0.000 when it should ideally be 1.0 This indicates that the engine has experienced so much knock that the Engine Control Module (ECM) has gone into “limp home” mode, reducing boost, ignition, and using more fuel enrichment. C: Fine Learning Knock Correction has large negative values. Despite being in “limp home” mode, and the ECM adding 25% extra fuel enrichment, the engine is still experiencing knock, such that it is removing as much as 11.75 degrees of ignition advance. 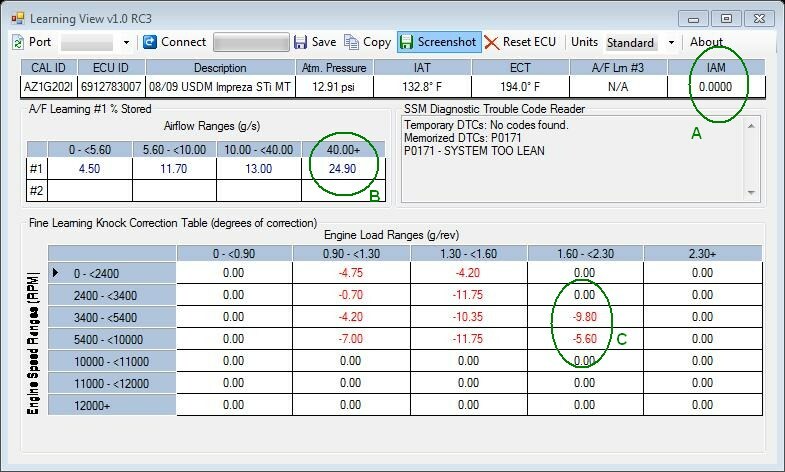 Use the correct calibration or stick with the stock intake.